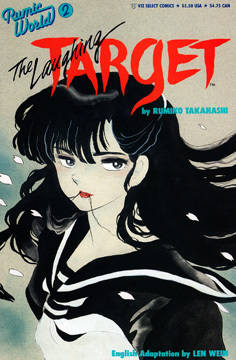 So far in "Project T," Jason and I have looked at some of the lengthier series that Rumiko Takahashi has done throughout her career as a manga artist, from classic favorites like "Urusei Yatsura" and "Maison Ikkoku" to lesser-known works like "Mermaid Saga." This month: "Rumic World Trilogy"
But aside from these longer works, she did several one-shot stories that were eventually collected under the "Rumic World" heading. Three of those works -- "Fire Tripper," "Laughing Target" and "Maris the Chojo" -- were given the royal treatment. They were made into hour-long anime in the 1980s and brought over stateside by Central Park Media and U.S. Manga Corps in both English-dubbed and subtitled versions. While the domestic anime licenses have expired and you can find those anime only on VHS and laser disc, the stories live on in print form in the first volume of Viz's "Rumic World Trilogy," which is still relatively easy to find. "Laughing Target" and "Fire Tripper" were also published by Viz Comics as now-rare small graphic novels. In "Fire Tripper," a terrified young girl finds herself somehow transported from her burning home in ancient Japan to an unknown city in the modern-day country. A couple finds her and adopts her, giving her the name Suzuko. Years pass, and Suzuko is now 17 years old. She's walking home from school one day with her neighbor's 6-year-old son, Shuhei, when a sudden gas explosion sends her and Shuhei once again into feudal Japan, on a battlefield full of dead soldiers during the civil war. A young warrior named Shukumaru saves her from three attackers and brings her back to his village, where Suzuko meets his kid sister -- a strangely familiar girl named Suzu. But Shuhei is nowhere to be found, and she returns to the battlefield to search for the boy. The villagers, meanwhile, prepare for an expected attack by Red Horse's men, in revenge for the three that Shukumaru killed to save Suzuko. Shukumaru is naturally smitten by Suzuko and almost immediately decides that they'll be married after Red Horse's assault. Through various clues, Suzuko eventually pieces together the truth behind how the lives of Shuhei, Shukumaru and her intertwine. Most readers will easily figure out the connection, but a heartwarming twist comes when Suzuko decides how to put that information to use and chooses the path for all of their lives to take. The English dub of "Fire Tripper" is a trip in another way, with British-accented voices and dialogue replete with British expressions. ("Shove off and mind your own business!" Shukumaru tells another villager at one point.) 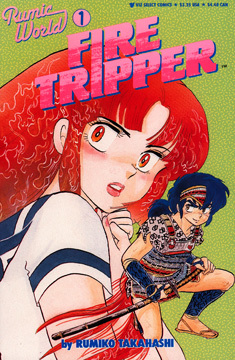 The English-language script also omits a few sentences that more clearly explain the "Fire Tripper" title, but the anime adds a few new scenes at the end that show what happens to the young couple. ROMANCE IS also the focus of "Laughing Target," but in a dangerously obsessive form. In this horror story, cousins Azusa and Yuzuru are betrothed as children in an agreement struck by Azusa's mother to carry on the Shiga family. The girl Azusa is thrilled, and she persuades Yuzuru to make a "pinkie promise" as a gesture that they will be together forever. Yuzuru and his family eventually settle in Tokyo while Azusa stays with her mother in their home province. When her mother dies in a mysterious manner, the now-teenage Azusa insists on fulfilling the betrothal and heads to Tokyo to claim on Yuzuru's childhood promise. But the youth has never taken the betrothal to heart, possibly in part because his father was against the engagement, and he fully expects his cousin to call it off. He also has a serious girlfriend, Satomi. Azusa, on the other hand, has always been fixated on Yuzuru. She is very much determined to marry him, and nothing -- especially not Satomi -- will get in her way. Events in Azusa's childhood have given her control over chirruping, always-hungry ghosts that hide in the shadows, and she uses these creatures against Satomi. The "Laughing Target" anime makes several changes to enhance Azusa's demonic nature. The opening already shows her being possessed as a child, and the original beginning scenes in the manga are now more effectively used as flashbacks. The end is made more dramatic as well, although an added scene in the anime tries too hard to milk some more evil out of Azusa, detracting from the heartfelt love that is the core of the girl's tragic character. ON THE other end of the spectrum is the sci-fi comedy "Maris the Chojo," which is firmly on the "silly" side of Takahashi's works. Maris, a native of the planet Thanatos, is part of the Special Forces of the Space Police. With her quick temper and Thanatosian strength that makes her six times stronger than a regular human, she's prone to breaking expensive equipment during her missions despite being made to wear a power-suppression cast. To pay for all the damages she racks up, she often works menial jobs during her vacations. On another of her working vacations, she's suddenly called back to rescue an important hostage: Koganemaru Matsushita, son of one of the richest families in the galaxy. Maris immediately has fantasies of Koganemaru being so grateful to her for rescuing him that he'll ask her to marry him, thus putting an end to all her debts. With this ecstatic image in mind, Maris rushes to rescue the poor trapped quadrillionaire. But the kidnappers know she's coming and are ready for her -- and there's an unknown aspect waiting to manifest and completely foil Maris' plans. The dialogue is pure Takahashi humor, with both the heroes and villains taking an absurd view of their situations and who fly off the handle at any little provocation, and a twist to the end that solidifies Maris' status as a born loser. The Japanese manga was originally called "The Supergal," and Central Park Media kept the title for the anime version. However, subsequent releases were renamed "Maris the Chojo" after a lawsuit by a comic-book company claimed "The Supergal" was too similar to one of its comic titles. Whatever the name, "Maris" is a fun story that you're sure to enjoy.